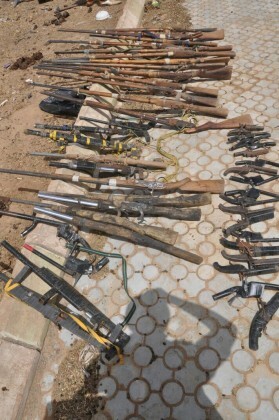 SK Usman, Abuja: The disarmament efforts to cattle rustlers and armed bandits spearheaded by Zamfara State Government and 1 Division Nigerian Army has been yielding fruitful results as more of such persons surrender their arms and other dangerous weapons in Zamfara State. Disarmament over the weekend, ‘Yansakai Vigilante and some repentant cattle rustlers and armed bandits from Kango and Dansadau towns in Maru Local Government Area, Nasarawan Godel in Birnin Magaji Local Government Area, as well as Wunaka town in Gusau Local Government Area, handed over one G3 Rifle, 434 Dane Guns, 69 Locally Made Pistols, 8 Locally Made Revolvers, 39 Locally Made Multi-Barrel Pistols and 36 Locally Made Double-Barrel Rifles. After the disarmament, weapons were handed over to 223 Battalion of 1 Division Nigerian Army, in the presence of some Zamfara State government officials and representatives of various Security Agencies in the State.